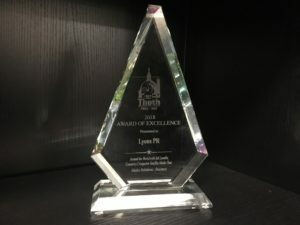 Lyons PR was presented the Award of Excellence for Best Business Media Relations Campaign during the 2018 PRSA-National Capital Chapter Thoth Awards. The Thoth Awards, named for the Greek god of communications, recognizes outstanding strategic public relations programs and components developed and produced in the Greater Washington, D.C. area. The award-winning campaign on behalf of Marriott/SPG, included a satellite media tour from New York City featuring loyal SPG member Sal Lavallo as spokesperson. At 27, Lavallo would become one of the youngest people ever to visit all 193 countries in the world. For the interviews, Lavallo shared his insights into the benefits of travel loyalty programs, along with travel tips, hacks and anecdotes from his adventures. The SMT was timed to be conducted just a few weeks after Lavallo stepped foot in his final country and just prior to the holiday travel season. Visuals are an important component to any successful SMT, which is why a Lyons PR videographer was dispatched to Malta, the final country of Lavallo’s quest, to capture the last step of his journey. Footage from Malta, combined with photos from his travels throughout the world, provided a picturesque backdrop to all of his TV interviews. In all, nearly 30 broadcast interviews were conducted as part of the satellite media tour, plus, in-studio interviews in New York with CNBC and Cheddar TV.